Learning about Canon camera accessories doesn't have to be painful. Here is where you'll find helpful tips and useful advice on Canon camera gear, including Canon cameras, Canon Lenses, Canon flash, as well as some smart alternatives. I don't work for Canon in any way. I've just had a lot of experience using Canon gear over the years. Here's the legal disclaimer. Anyway, let's dive right into the advice on Canon gear. Whether you're buying a new camera, a lens, or a thingamajig made by Canon, or God forbid, another manufacturer. Use the main menu up above or a search box to find the specific answers to your questions. I can help you make the right choice on a Canon camera, lens, or an accessory that will help you improve your photography. Have you ever felt confused about a feature on a camera, an accessory, or another piece of photography equipment? Maybe you just need a little how to information to help you use an accessory more effectively. Are you curious about a camera or an accessory? I don't work for Canon, but I've had a lot of experience using their cameras, lenses and other accessories, so I should be able to help you find what you're looking for. At least that's what you can expect. You can read page after page of confusing technical jargon, spend hours and hours reading the reviews, or try something simpler. That's what the Canon Camera Geek web site is all about, giving you simplified information to help you make your choices on Canon camera equipment. Ask me a question directly. It's all about Canon cameras, accessories and lenses, which ones are worth buying and which ones are not. I gave it the name Canon Camera Geek because it focuses mostly on Canon Camera equipment. It is written for you if you're a dedicated Canon enthusiast, a casual hobbyist, or even a brand new user of Canon photography equipment. From time to time, you will also find reviews and opinions on Non-Canon camera equipment if it is useful information for Canon users. You can use the search box at the upper right corner of the pages to help you find the information you need to get. If you are looking for a long technical Canon camera review, overloaded with numbers and meaningless statistics, I'll be honest with you; this site isn't for you. If you have a need to read long and boring articles with every tested specification and chart full of numerical data this might not be the best source for you. Do I look at numbers? Absolutely, but I try to stick to the ones that matter. This website is more of a way to getting simple, practical opinions on using cameras, lenses and accessories, getting the right equipment at the right price. 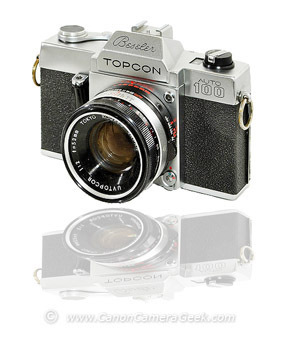 Even if you don't own any Canon cameras, lenses or other Canon accessories, you may find this site useful. It will help you make choices and learn about advantages and disadvantages of digital photography equipment and their features. The majority of the reviews are on Canon photography equipment, cameras, lenses, speedlites, and other accessories. That's what this web site focuses on. (There is a pun in there somewhere).. It's not overloaded with the technical, in-depth, scientific, full-of-numerical-data, reviews. Don't get me wrong, shutter accuracy, exposure performance, lens chromatic aberration and distortion data is important. The scientifically based Canon equipment reviews serve an important purpose. They are good for comparison between different models as well as choosing between different camera manufacturers. Here, you will find more practical digital camera and lens reviews, based on the technical stuff digested for you. The scientific test data gets combined with my practical experience as a professional photographer. Here is my disclaimer though. I didn't start out as a Canon Geek. This web site is not affiliated with Canon in any way and I have no association with Canon other than my knowledge from buying and using many of their fine products for many years. Also, I am not a professional writer. That likely will be come apparent quickly but my intent to provide you with valuable information is genuine. 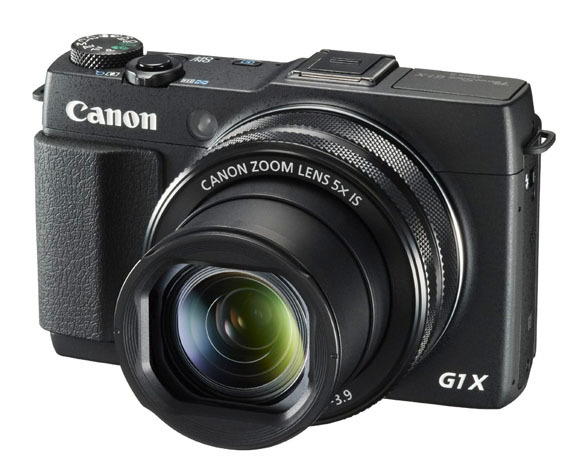 The goal of this Canon Camera Reviews web site is to be valuable to you; to provide relevant, accurate information about cameras, lenses and accessories. My wife and I started with a simple point and shoot, the A620 in 2005. Since then we've progressed through 10D, 20D,Powershot G11, 5D Mark I, Canon 5d Mark III, many Canon Lenses. 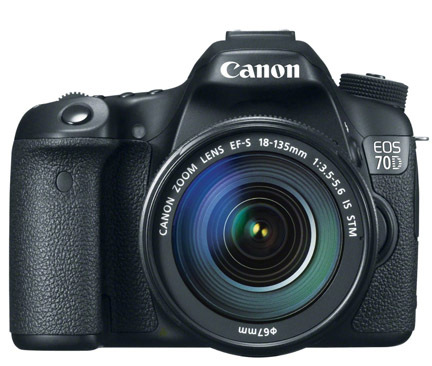 Most recently (as of January 2015) I use a G1x Mark II and an EOS 70D quite a bit. Having Canon 5d, 10d, and 20d bodies as well as Canon 85mm f1.8, 24-105 lens, 28-70 lens and Canon Speedlite 270ex-II and Speedlite 580ex flashes has given me a wide range of experiences with the Canon brand. 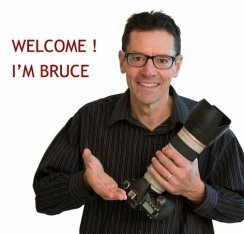 My portrait clients bombard me with questions about digital cameras and related photography equipment. This is what led me to write the Canon Camera Reviews website. I didn't start out as a Canon Camera Geek. The first time I ever used a camera was in 1968 and it was a cheapo plastic camera made by Kodak. My first slr (single lens reflex ) camera was a Beseler Topcon Auto 100, followed by a Minolta SRT 102, and then a Minolta XD-11 in 1977. I can still hear the "KaPlunk" sound of that mechanical shutter in the Topcon. You remember certain things from your childhood very vividly. It's like your first car or your first girlfriend-you never forget them. After the Minolta, I became acquainted with the Canon AE-1, aggressively promoted in commercials by tennis star Tracy Austin and Olympian Jennifer Chandler. My first digital camera was a Canon Powershot A620 which my wife still uses to this day. No, now she uses my G1X Mark II. My second confession is that my first digital SLR was not a Canon Camera. It was the Olympus E-10. 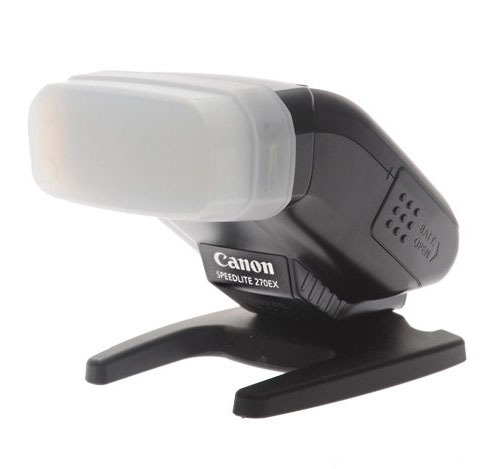 You can get reviews on Canon camera accessories, like lenses, flash, tripods and all the other cool Canon camera gadgets, along with photography tips on this web site to get the most out of your Canon equipment. There are also reviews on non-Canon digital photography equipment that you should use instead of the Original Equipment Manufacturer (OEM) or perhaps avoid in some instances. 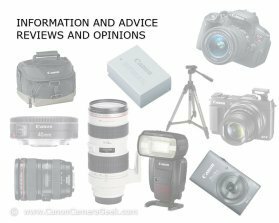 If you'd like to ask any questions on canon cameras, lenses or accessories you can do so on this Canon Camera Reviews web site, directly below. You can also give your own Canon camera reviews too. 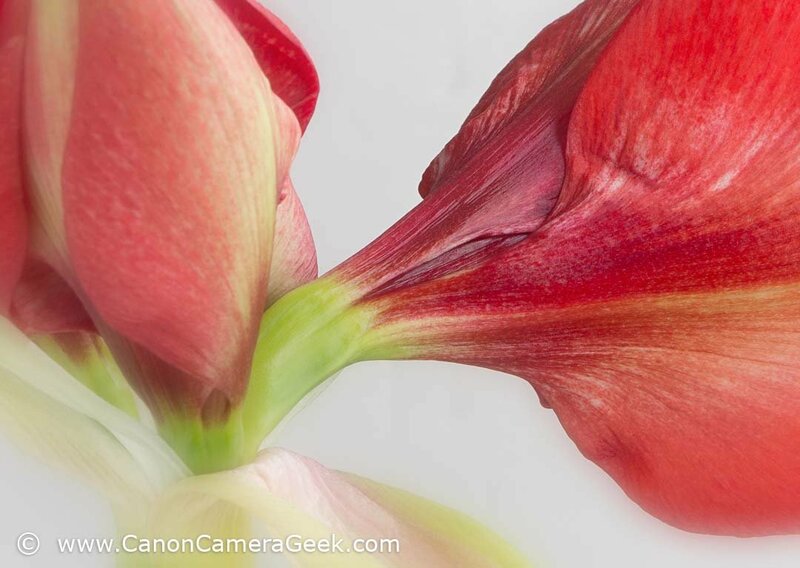 I truly hope you enjoy the Canon Camera Accessories and Reviews site. CanonCameraGeek is NOT associated with Canon Inc. or any of its subsidiaries. A recent macro photo taken with a Canon 70D. 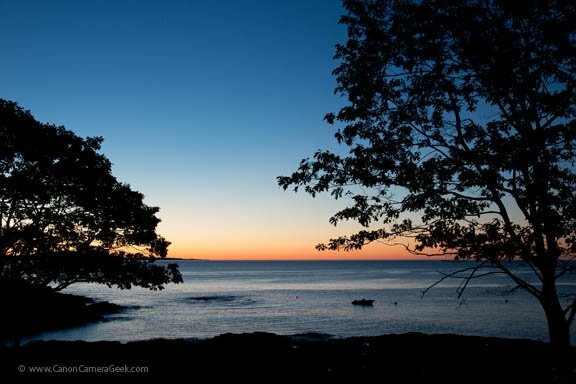 Photo taken in Acadia National Park with Canon 24-105 Lens on a Canon 5D Mark III. It's one of my favorite destinations for traveling photography and I usually have some new gear along with me to test when I go. 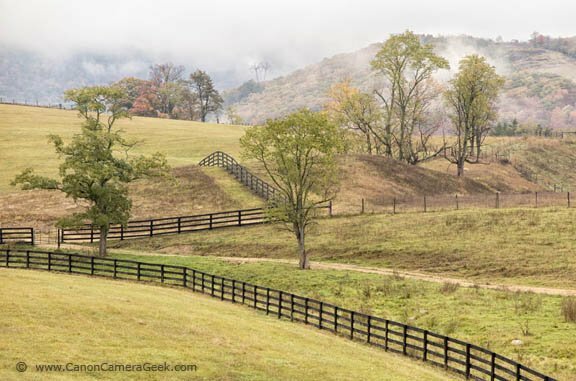 Photo taken with Powershot G1X Mark II, during a photography workshop in West Virginia. Lately, when I hike I carry the G1X Mark II and a Canon 70D with a long lens in case any wildlife get within camera range. 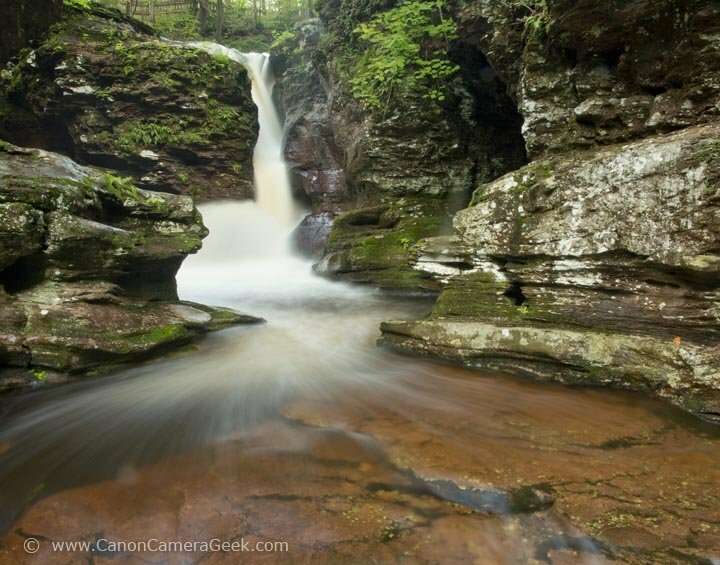 Taken with the Canon 5D Mark III, I go to Ricketts Glen in Eastern Pennsylvania every year to photograph the waterfalls. I go during the week, hitting the trail at the crack of Dawn and usually don't see another human being for a few hours. The 70D is my camera of choice when I go hiking. It's a fast focuser, can handle all of my Canon L lenses and is small enough to carry in one of those belly bags for quick access. What I like most about this camera is that it fits in a pocket, it has a large 1 inch sensor, and shoots in RAW mode. I also like having an optical viewfinder and hot shoe attachment. The two things that could be better on this camera are its focusing and it's low light level image quality. I like how small this flash is. I can use the bounce feature when it's attached to the hot shoe or I sometimes attached it to a hot shoe cord and use it off camera. I use the 70-200 lens for most of the portrait work I do with the exception of photographing babies and large groups. This particular shutter cord has a built in intervalometer, meaning you can program it to take photos at intervals to take some really cool time lapse photography. Canon has two broad categories of cameras, the EOS line of DSLRs and professional cameras and the Powershot Point-and-Shoot variety. 1. A small shop in Japan started making a camera called a "Kwanon" in 1933 that later evolved into the "Hansa Canon." 2. Canon launched its first digital camera, the PowerShot 600 in 1992. That was the start of Canon's digital camera era.